Home Catalog Ordering & Shipping Electrical Tech Work Shop Tips About M.A.D. The alternator and the voltage regulator was the same as with other GM cars, but wiring layout makes the Chevy system unique. Knowledge of this exclusive design is very important when up-grading the Chevy electrical system. We need to get electrical power from the alternator to the parts–not just charge the battery. With up-grade to a “THREE-WIRE” alternator with built-in voltage regulator, the electrical system can perform very well with a minimum of wiring work. And, considering the amount of “ONE-WIRE” alternators sold nowadays, it’s important to note that effective use of the “ONE-WIRE” alternator will require modification to the wiring system. It turns out that with the typically equipped Muscle Car Chevy, a (properly wired) 70amp “THREE-WIRE” alternator will deliver better performance than a 140amp “ONE-WIRE” alternator! It’s about time that someone completely analyzed the system, explained the original system function, and pointed out the best up-grade methods. At the time of this writing, the popular Chevy main power system is about 40 years old. The original version was installed with the first alternators, in 1963 Chevy models. The current trends are to improve these cars, and there are plenty of “bolt-on” parts for us to work with. We often expect better performance from these cars than when they were new. Popular improvements include better brakes, better handling, better engines, better cooling systems, and of course… better ignition and electrical systems. Routing and distribution of alternator power output is handled by the wiring system. When installing more powerful alternators, and also when adding accessories that will use power, current flow through the wiring system is increased. And the wiring becomes more important than ever before. The system diagramed above is typical of the original Chevy wire harness design used in 1969,1970, and 1971. Those years had the long nose water pump and passenger side alternator mounting. The entire electrical system gets power from the “SPLICE” near the Horn Relay, at the opposite side of the car from the battery! Alternator output is routed directly to the splice. 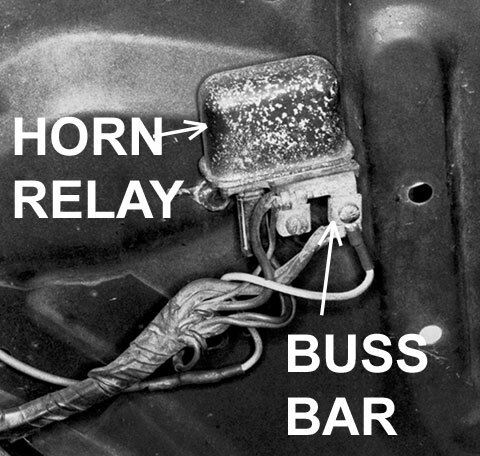 One of the wires from the splice delivers power to the Horn Relay buss-bar, where the dash “main power wire” is also connected. The battery charging wire originates at the splice. And vital to electrical system performance in this original system, the voltage regulator will read and adjust voltage level at the splice. The splice is the center hub of this electrical system, and maintaining proper voltage level at the splice is the key to good performance with this original system. The photo above shows the “SPLICE” in the wire harness, which served as the “MAIN HUB” for distribution of alternator power. All power to operate the electrical system plus power to recharge the battery is routed through this splice. This type of factory splice is very reliable, as it is crimped and soldered, and then covered with tape. The splice is in the wire harness, along the driver’s side fender, at the engine side of the radiator core support. “Buss-bar” is also correct terminology for a common connection where wires come and go. The splice in the wiring and the Horn Relay both serve as buss-bars in this system. All voltage regulators take a voltage reading, and from the reading the regulator will make the correct adjustments to alternator output. Leading authorities have often told us not to accept more than 0.4volts difference between the alternator and the battery! In fact DELCO REMY published engineering data for wiring the components they built, instructing maximum of 0.5volts difference between the alternator and battery, with the alternator operating at maximum output. Also on the same engineering data sheet, DELCO REMY published recommendation for minimum cable gauge sizes per feet of cable between the alternator and the battery, and included various alternator output ratings in the chart. For alternator output ratings between 50 and 65 amps, the chart begins with 8gauge for total cable length at 4 to 7feet. And by the time the total cable length grows to ’69 Camaro dimensions, DELCO recommends 4gauge cable! In this author’s many years of workshop experience, an original GM built passenger car with larger than 10gauge wire for 63amp alternators has never been encountered. The instruction was intended to help with the wiring job to be done by Chevy (and also other carmakers and companies who might install DELCO REMY alternators). The engineering data was published as a guideline to insure proper system operation when using the parts built by DELCO REMY. Sometimes these guidelines are intended as a cover all blanket, work in all situations, and always get the job done installation method. (Guidelines are intended to keep people out of trouble.) In other words the provided recommendations are guidelines, but not intended as solid, rigid, “never-to-be-an-exception,” rule. If cars would have been entirely built using all minimum engineering recommendations for copper cable gauge sizes, then these cars would be hauling around a few hundred pounds of very expensive copper cable. Since it was not practical to install so much heavy copper cable on the millions of cars built, Chevy engineering provided a practical exception to the rule. At least one thing about wiring for this Chevy alternator system is very unusual, excessive voltage drop between the alternator and battery will occur with normal system function—and yet the electrical system worked fine. The battery charged perfectly and electrical system performance was not compromised in the least bit. It was a feat accomplished by the wiring system layout. Not only that, but it was a forgiving system that was more gentle to batteries and alternators in the event of recharging a battery while driving! No doubt those “rebel with a cause Chevy engineers” who came up with this system knew exactly what they were doing. Truly the Chevy wiring system was unique. The design caused the voltage regulator to take voltage reading from the main power distribution hub (the splice). The heavy cable and minimum voltage drop recommendations from DELCO would have worked, even without special attention to where the voltage regulator would take voltage level reading. When current flow through long wires is a large amount, a “problem” with significant voltage drop will occur. But regarding voltage drop at the long length of “alternator output wire,” the system was self-compensating. The regulator took voltage reading from the splice, which distributed alternator power. (“Voltage-Sensing was not from the alternator or the battery!) The regulator adjusted alternator output as required to maintain proper voltage level at the splice. Therefore a little voltage drop in a long wire from the alternator did not reduce system performance. The alternator did not mind producing power at 15.2volts, which allowed for a 1volt drop in the long wire, to arrive with power at the “splice” at 14.2 volts level. This part of the system layout did not happen by chance. 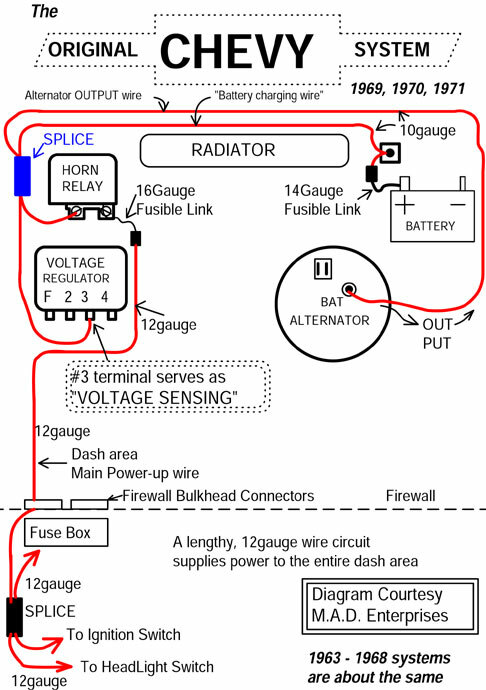 The voltage sensing wire from the regulator was connected where it would optimize system performance, which let the main hub distribute power at 14.2volts. It was a wiring design created with definite purpose in mind. Thanks to some clear thinkers at Chevy engineering department we were spared some cost, and weight, and bulky cables at the front of these cars! In the case of voltage drop at the long “battery charging wire,” the small amount of voltage drop was actually a good thing. In honest retrospect view of the long battery charging wire, the beneficial side effect caused by the long wire was probably not intentional. More likely it resulted from location of the parts. The battery tray was on the passenger side. The driver’s side had the alternator, voltage regulator and dash power hook-up at the Horn Relay. The battery charging wire connected the battery at the right to the rest of the system at the left. Knowing that the battery would eventually become charged and significant voltage drop would then disappear, it’s likely that the engineering department simply allowed it to happen. Current flow through the battery charging wire will only be a large amount when the battery is discharged. Therefore, significant voltage drop only occurred when recharging a low battery. This is when the beneficial side effect comes into play; the voltage drop in the battery charging wire slowed the battery charge rate. Slow rate battery charging is less abusive to the battery than a fast charge rate. Slowing the charge rate a little can also reduce the probability of alternator overheating damage when recharging a low battery while driving. And slow charge rate reduces corrosion at the battery area of these good-looking Hot Rods! The battery stops accepting much current as it becomes fully charged, and as current flow tapers off then voltage drop is reduced. Therefore a small amount of resistance at the long battery charging wire does not prevent the battery from becoming fully charged—it just takes a little longer to recharge a “low” battery. Brightness of lights, strength of ignition, and performance of other electrical system parts was not affected by voltage drop in the battery charging wire—because the electrical system did not draw power from the “charging wire” in this Chevy system. The electrical system draws power from the splice, where voltage is controlled by the regulator. The condition of connections at the Horn Relay screws is very important to system operation. The entire dash area will be operating with power drawn from the screw connections, and they deserve occasional inspection. The metal bar at the base of the Horn Relay is insulated from the body of the relay, it is full-time “live,” and it is where the dash wiring connects to power. Connections at the buss-bar screws must be clean and tight. Relays with a rusty or corroded buss-bar should be replaced with new. Wire terminals may be polished with a small wire brush. When Up-grading the alternator and using this original wiring system, proper voltage must be maintained at the splice and Horn Relay area. It’s a simple requirement, and more than one method may be used to maintain the voltage needed for good electrical system performance.